Indians (Indus valley residents) and Iranians (Mesopotamians) shared a common religious past, which led historians to sometimes even term the common ancestral religion as Proto-Indo-Iranian religion. Have we ever understood the implications of this common religious past of the two communities on the historical studies of the two regions? Zoroastrianism was the most prominent religion of Mesopotamia. It was the dominant world religion during the Persian empires (559 BC to 651 AC), and was thus the most powerful world religion at the time of Jesus. It is still practiced world-wide, especially in Iran and India (Zoroastrian in India are known as Parsi or Parsee). When we peep into the religious beliefs of Zoroastrians or Parsees we come across their main God called Ahura Mazda. Their holy books talk about two types of people — Devas and Yazats. They believe that Devas represent evil spirits and most importantly, they are led by the demonic evil spirit called Ahriman. On the other hand, Yazats are the followers of the Supreme God Ahur Mazda. They are the righteous people, an embodiment of everything that should be correct. The god of the Vedic people is the evil spirit of the Zoroastrians! According to sacred texts of ancient India, there are two types of people — Devas and Asuras. Devas were considered good beings and Asuras were considered as evil beings. As per Vedic Tradition, Brahman is the Supreme Being who has created everything in Universe. The Asuras were lead by their Guru Shukra. Do you see anything that relates the two beliefs? In today’s geographical terms, these are two communities of people who lived on either side of the current day Afghanistan, separated by a few hundred miles. The persons living on western side of Afghanistan were calling the evil spirit as Ahriman and the persons living on eastern side of Afghanistan call their God as Brahman. If one notices the linguistic similarities between Ahriman and Brahman we realize that Ahriman is a distortion of the Sanskrit word Brahman. The Sanskrit word was distorted to Ahriman as it traveled in Mesopotamian region thousand of years ago. The god of the Vedic people is the evil spirit of the Zoroastrians! The evil spirits feared by the community on the west side of Afghanistan are Devas. And the good-natured gods of the Vedas on the east side of Afghanistan are also Devas. Both are the same. 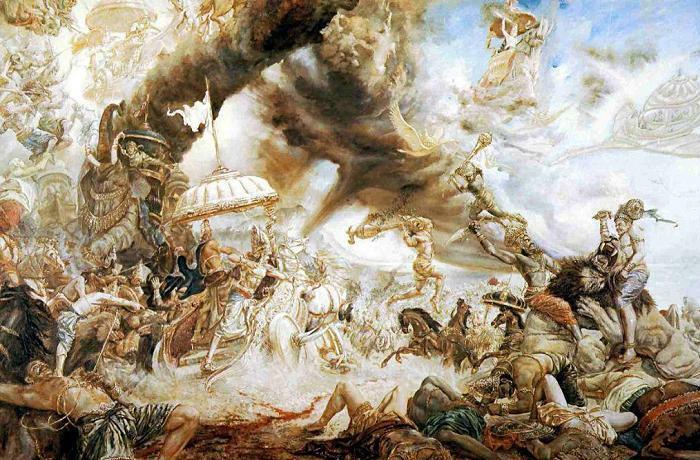 Zoroastrians hated the Devas of the Vedic people! The god of the people on the left side of Afghanistan is Ahura Mazda and his follower are called Yazats. The evil spirits feared by the Vedic community on the east side of Afghanistan are called Asura. Again one can notices the linguistic similarities between Asura and Ahura Mazda, which is a distorted form of Sanskrit word Asura Mahadev, meaning Great God. Asuras of Vedic Traditions were followers of Ahura Mazda or Asura Mahadev. Also their is phonetic similarity between Rakshasas and Yazats. A Rakshasa is a demon or unrighteous spirit in Hinduism and the terms Asura and Rakshasa are sometimes used interchangeably. Usage of these terminologies survives to the current day, even after eons, across the scores of languages of India. Killing a demon or evil person is called Asura Vadha in Indian languages; and an extremely evil deed is even today called Rakshasic. These two communities on either side of the present day Afghanistan were battling each other for hundreds of years or probably even thousands of years. They were battling each other for survival, each fearing that a loss would decimate their culture and everything else with it. What is the source of hatred for each other? Why did they fight each other so much? The scriptures of both the communities once again provide the answer. Indian scriptures tell us that their civilization was made up of two types of beings — Deva and Asura — born of the same parent. Devas, being virtuous, were the toast of all and were bestowed with most of the important and responsible posts of the world by God, while the Asuras were always downgraded by Devas. Once in a while, they waged wars with Devas to reclaim their motherland. As per Mesopotamian legends, they were once the servants of Gods. They revolted against the Gods and were forced to left their homeland. That is how Mesopotamian came into existence. India was the original homeland to the two communities — a group of people called Devas and to Mesopotamian (then called Asuras). Both of them lived together in India. In the ensuing economic and civilizational progress, Devas got most of the pie, while Asurs felt left out. Zoroastrianism was born as a revolt against the religious setup in India. Because of this Zoroaster thought that there was a great deal of injustice done to his people i.e. Asuras by Devas. So he revolted against it and started rejecting the religious practices of Devas. He felt the need of a new religious set up for his people to unite them and the concept of Zoroastrianism was born. After that He left India with his followers and settled down in the region in today’s Persia and Mesopotamia. Historians are still so confused even today because they have still not understood the events that led to the birth of Zoroastrianism and why Devas and Ahriman, who were once worshiped, were suddenly shunned as evil beings by later day Mesopotamians. Zoroastrianism was born as a revolt against the religious setup in India. Zarathustra received his divine revelations in a mount in India and he was born in India and not in Mesopotamia. The Zoroastrianism is nothing but an offshoot of Sanatana Vedic Dharma Of India. That is why it started believing that Devas were evil spirits and Asuras were good spirits. It was a set up against the Devas and that is why they were expelled from India. This again proves the irrefutable fact that the Mesopotamian Civilization was created and founded by Ancient India. – Book Titled “19000 Years of World History – The Story of Religion” by Prithviraj R.
I think this article is a bit far fetched. As per accepted history, the proto Indo-Europeans/ Iranians came from Central Asian steppes, and before coming to India they lived in Iran, where the proto-Indo-Iranian religion was established. The same people came to India and gave rise to the Vedic religion. In Iran, however, a prophet like figure Zarathushtra created his own religion, and to distinguish it from the original Iranian religion (which was very much similar to the ancient Vedic religion), he made certain changes. But, there are still several similarities. In India, however, Sanatan Dharma descended from the Vedic religion, but it wasn't based on any one prophet like figure, but was evolved overtime. This Sanatan Dharma is quite different from the original Vedic dharma, and many of the prominent gods of the Vedic religion (which were also the same of the ancient Iranians) like Vayu, Indra, etc. were relegated to an inferior position, while the new gods from the merger of the Aryan-Dravidian cultures, or those who were of the Aryan descent but were established in India (like Ram), took the leading positions.